"Cook and Cook Hill, Washington"
Click image to enlarge Cook, Washington, as seen from Viento State Park, Oregon. Image taken September 25, 2005. The small community of Cook, Washington, is located just west (downstream) of Drano Lake and the mouth of the Little White Salmon River, at Columbia River Mile (RM) 161. 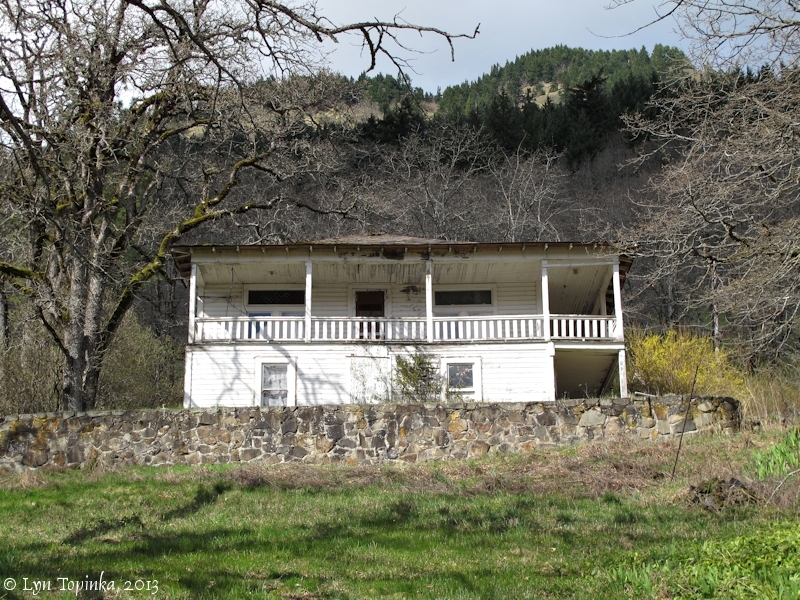 Upstream are the Washington communities of Hood and Underwood, and downstream lies Dog Creek, Dog Mountain, and the old Washington community of Collins. A good view of Cook can be had from across the river at Viento State Park. Today's Cook, Washington, was first known as "Cooks Landing" before taking on the shortened name of "Cook" (Post Office name) or "Cooks" (Railway name, see more below). The community was named for Charles A. Cook, who homesteaded the ground on which the town was built. At one time Cook was a busy steamer landing spot. The U.S. Bureau of Land Management's General Land Office (GLO) Records website (2012) shows a Charles A. Cook being granted title to 160 acres of T3N R9E, parts of Section 10, on December 22, 1896 (1862 homestead entry original). This lies north of Cook Hill. 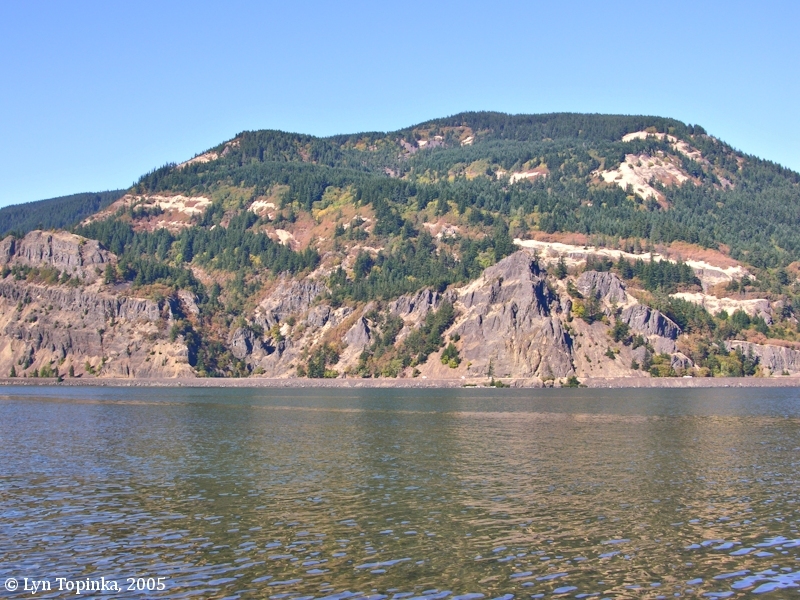 Between 1905 and 1908 the "North Bank Road" (Railroad) was built along the north bank of the Columbia River. The Railway used the name "Cooks" for its station at the small settlement then-known as "Cooks Landing". The Cook Post Office was established in 1908. It closed in 1965. It did not appear in the 1908 "Official Postal Guide" but it did in the 1910 Guide. Post Office: "Cook, Skamania, Wash."
Cook Hill borders the western side of Drano Lake and rises above the town of Cook. The hill separates the Little White Salmon River from the Columbia River. According to the U.S. Geographic Names Information System database, Cook Hill is at elevation 2,887 feet. 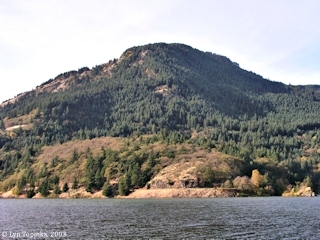 Click image to enlarge Cook Hill, as seen from Drano Lake, Washington. Image taken October 25, 2003. 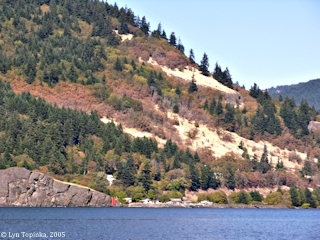 Click image to enlarge Cook Hill, as seen from Viento State Park, Oregon. Image taken September 25, 2005. 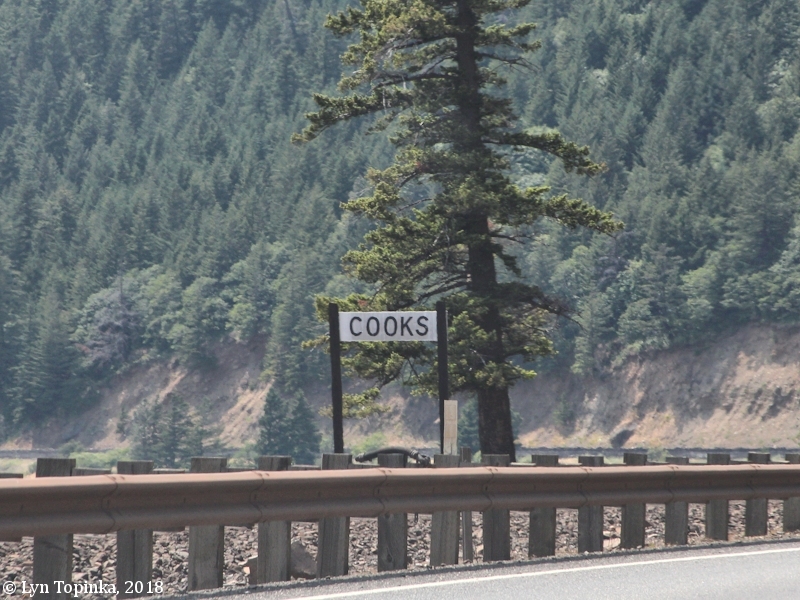 The Cook-Underwood Road traverses nearly 15 miles along the slopes of the Columbia River Gorge, north of Washington Highway 14, and stretches from Cook, on the west bank of the Little White Salmon River (RM 161.5), to Underwood, on the west bank of the White Salmon River (RM 168.5). Click image to enlarge Old house on Cook-Underwood Road, Washington, near Cook. Image taken March 18, 2013. The early Washington community of Cook was first known as "Cooks Landing" before taking on the shorter versions of "Cook" (Post Office name) or "Cooks" (Railway Station name). Remodeled Steamer Will Resume Her Trips on Upper Columbia. Captain E.W. Spencer will start his steamer, the Charles R. SPencer, out on the Portland-Dalles run next Wednesday morning. The boat will be brought down today or tomorrow from the Portland Shipbuilding Company's yard, where it has been lengthened and torhorughly overhauled. The time card, which has just been issued, announces that the Spencer will leave Portlan on Mondays, Wednesdays and Fridays, at 7 A.M., arriving at The Dalles at 4 P.M. She will return from The Dalles on the other days of the week, leaving at the same time and reaching this city at 3 P.M. Stops will be made at Vancouver, Washougal, Cape Horn, Butler, Cascade Locks, Stevenson, Carson, Collins, Cooks, Drano, Underwood, White Salmon, Hood River, Bingen, and Lyle. ... The regular fare between Portland and The Dalles is $2.50 for the round trip, and $1.50 one way. Freight is taken on a graduated schedule." Source: "Morning Oregonian", April 15, 1904, courtesy Oregon Historic Newspapers Archives, University of Oregon Libraries, 2016. Auto Caravan to Pass Over New Route to White Salmon. "WHITE SALMON, Wash., July 29. -- (Special.) -- It is anticipated that the Cook's grade of the North Bank highway will be open to traffic before August 15. The sum of $60,000 is begin expended in standardizing the grade east of Cooks. By the time crews have finished the Cooks grade the last link of the Mount Adams highway between Glenwood and Yakima will be open. It is planned then to bring a caravan of 500 automobile loads of Yakima motorists down over the new route to White Salmon and thence to Vancouver over the North Bank highway, thence to Portland." Source: "Sunday Oregonian", July 30, 1922, courtesy "Historic Oregon Newspaper Archives, University of Oregon Libraries, 2016. Post Office, Place, County, State: "Cook, Skamania, Wash."
Railroad on which located or nearest R.R. Station: "RR and Landing name Cooks". 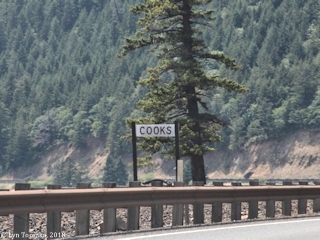 Click image to enlarge "Cooks" Station as seen from Washington Highway 14. Image taken June 6, 2018. The Great Northern Railway and Northern Pacific Railroad, competitors in the transcontinental business, launched the Seattle Portland & Seattle Railway in 1905 and built a line along the north side of the Columbia River. 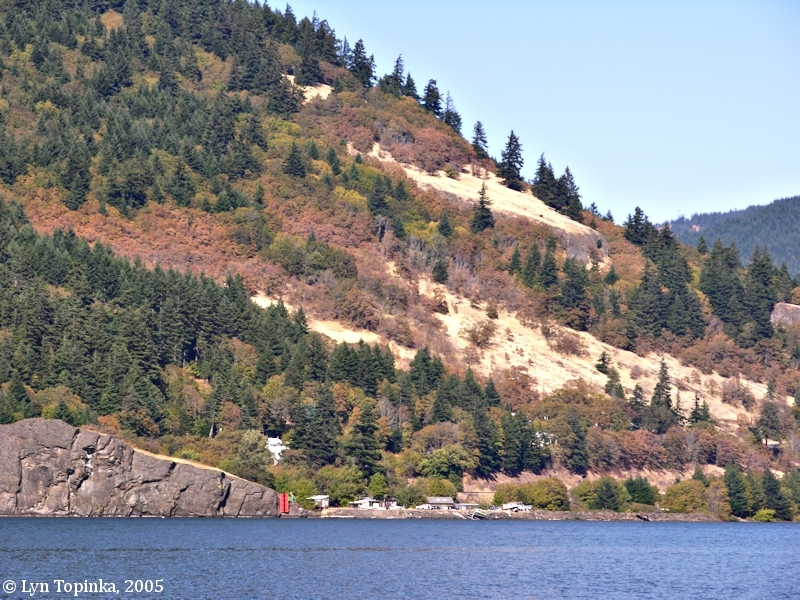 This line was known as "The North Bank Road", "The North Bank Railroad", "Columbia River Scenic Route", and "The Northwests Own Railway". The tracks were started in October 1905 and completed in February 1908, with a celebration being held on March 11th at Sheridan Point upstream of the Fort Rains Blockhouse location. On March 19th, regular passenger servcie between Vancouver and Pasco was begun. The journey took eight hours.